To Cite: Rahpeyma M, Fotouhi F, Makvandi M, Ghadiri A, Samarbaf-Zadeh A. Crimean-Congo Hemorrhagic Fever Virus Gn Bioinformatic Analysis and Construction of a Recombinant Bacmid in Order to Express Gn by Baculovirus Expression System, Jundishapur J Microbiol. 2015 ; 8(11):e25502. doi: 10.5812/jjm.25502. Background: Crimean-Congo hemorrhagic fever virus (CCHFV) is a member of the nairovirus, a genus in the Bunyaviridae family, which causes a life threatening disease in human. Currently, there is no vaccine against CCHFV and detailed structural analysis of CCHFV proteins remains undefined. The CCHFV M RNA segment encodes two viral surface glycoproteins known as Gn and Gc. Viral glycoproteins can be considered as key targets for vaccine development. Objectives: The current study aimed to investigate structural bioinformatics of CCHFV Gn protein and design a construct to make a recombinant bacmid to express by baculovirus system. Materials and Methods: To express the Gn protein in insect cells that can be used as antigen in animal model vaccine studies. Bioinformatic analysis of CCHFV Gn protein was performed and designed a construct and cloned into pFastBacHTb vector and a recombinant Gn-bacmid was generated by Bac to Bac system. Results: Primary, secondary, and 3D structure of CCHFV Gn were obtained and PCR reaction with M13 forward and reverse primers confirmed the generation of recombinant bacmid DNA harboring Gn coding region under polyhedron promoter. Conclusions: Characterization of the detailed structure of CCHFV Gn by bioinformatics software provides the basis for development of new experiments and construction of a recombinant bacmid harboring CCHFV Gn, which is valuable for designing a recombinant vaccine against deadly pathogens like CCHFV. Crimean-Congo hemorrhagic fever virus (CCHFV) causes severe hemorrhagic symptoms in human with high mortality rate, approximately 30% (1, 2). The virus can be transmitted to human through the bites of infected ticks, direct contact with virus contaminated tissues or blood, or nosocomial infections. Incubation period is between 2 to 7 days, and patients show flu-like symptoms and then hemorrhagic state starts with bleeding from the mucous membranes and development of petechiae, associated with thrombocytopenia and leucopenia (3, 4). The ability of virus to cause nosocomial infections, make CCHFV a major public health concern (5). CCHFV is an arthropod virus that belongs to the family Bunyaviridae. Family Bunyaviridae comprises five genera: Orthobunyavirus, Hantavirus, Phlebovirus, Nairovirus, and Tospovirus. CCHFV, like all viruses in this family, has segmented negative-strand RNA genome. Small RNA segment (S) encodes a nucleocapsid (N) protein; medium RNA segment (M) encodes 2 membrane glycoproteins named Gn and Gc; and the large RNA segment (L) encodes an RNA dependent RNA polymerase. The glycoproteins are derived from a polyprotein by a proteolysis cleavage that leads to 2 structural glycoproteins known as Gn and Gc (6). CCHFV has been reported in more than 30 countries in Europe, Asia, and Africa. In Iran, CCHFV is an important health problem that is endemic in southeast region, Sistan-Baluchistan Province but sporadic cases occur in other provinces such as Fars, Isfahan, Kerman, Yazd and etc. Many people are infected with the virus through different routes of transmission and unfortunately some of them die (7-9). Members of the genus Hyalloma tick have been linked to the natural infection cycle of CCHFV. Ticks population survey in Iran has been shown that Hyalloma spp. are distributed in all parts of Iran and CCHFV has been isolated from ticks (10-12). Since mortality rate of CCHFV disease is very high, infection with this virus is a major threat for public health, especially when a safe vaccine is not available yet and antiviral chemotherapy (ribavirin) could not efficiently treat this illness (8, 13). So any effort to develop a vaccine against CCHFV has high importance. Baculovirus is an enveloped virus with double stranded circular DNA of 88 - 180kb as viral genome that packaged within rod-shaped nucleocapsids. Safety, high level expression of protein and posttranslational modification of expressed protein are advantages of baculovirus as an eukaryotic expression system. Recently engineered baculovirus vectors are developed which allows the propagation of virus genomes in Escherichia coli as a bacmid. Several research groups have expressed many microorganism genes in baculovirus expression system (14-16). Since interaction of CCHFV with its receptor is through its surface glycoproteins (Gn and Gc) and neutralizing antibodies are stimulated against these proteins, these surface proteins are important candidates for developing a potential vaccine (17). Prior to cloning and production of recombinant protein, the sequence, structure, and similarity of target protein must be identified. Bioinformatics analysis has opened new insights into protein sequence and structural features. We decided to study the structure of CCHFV Gn protein and generate a recombinant DNA bacmid harboring CCHFV Gn gene that can be expressed in insect cells by baculovirus expression system. Following expression, the recombinant Gn protein of CCHFV could be used as a vaccine against CCHFV or for laboratory diagnosis of this viral agent. We retrieved the sequence of M segment of CCHFV from national center for biotechnology institute (NCBI) database, and BLASTN analysis was performed based on that. To study CCHFV genetic diversity, we performed phylogenetic analysis by using MEGA software (version 6). A set of different strains of complete CCHFV M segment sequences were retrieved from NCBI and were aligned using CLUSTAL algorithm at the amino acid levels. Nucleotide phylogenetic trees were also investigated using neighbor-joining method. The amino acid sequence of Gn protein of CCHFV was retrieved from the NCBI database. ExPASy ProtParam server has been applied for the study of physicochemical characterization like theoretical isoelectric point (PI), molecular weight, and molecular formula, total number of positive and negative residues, instability index, extinction coefficient, aliphatic index, and grand average of hydropathy (GRAVY). We applied a new highly accurate secondary structure prediction method, PSIPRED, (available at http://bioinf.cs.ucl.ac.uk/psipred) for computation of secondary structural features of CCHFV Gn protein sequences. I-TASSER is a hierarchical protein structure modeling approach based on the second-structure enhanced profile-profile threading alignment, not homology modeling. 3D model of Gn protein of CCHFV strain accession number: DQ446216.1 was generated using I-TASSER (http://zhanglab.ccmb.med.umich.edu/I-TASSER), a web based server. High C-score and correlation between C-score and TM-score of model determine the best model. The C-score is a confidence score for estimating the quality of predicted models by I-TASSER. It is calculated based on the significance of threading template alignments and the convergence parameters of the structure assembly simulations. The C-score is typically in the range of -5 to 2, where a C-score of higher value signifies a model with a high confidence and vice versa. After selection of Gn coding sequence, the sequence was evaluated by on line RestrictionMapper software version 3 (available at http://www.restrictionmapper.org), to select appropriate restriction enzymes. For directional cloning, we designed 2 enzyme recognition sites for Bam HI and Xho I (Fermentas, Lithuania) on the 5’ and 3’ end of the construct, respectively. Owning to the lack of monoclonal antibody against Gn, we added V5 tag to C-terminal of Gn for western blot analysis. To obtain high level of protein expression, the codons of Gn sequence were optimized for expression in insect cells (Sf9 cells). The construct was synthesized by Bioneer (Seoul, South Korea) and delivered in pGEM-B2 vector (Bioneer, South Korea), named pGEM-B2-Gn. To amplify the construct harboring our interest gene, we transformed E. coli strain TOP10 (Invitrogen, Carlsbad, CA, USA) with pGEM-B2-Gn plasmid by calcium chloride method. Briefly, E. coli TOP10 was cultivated in Lysogeny broth (LB), containing 10 mg/mL ampicillin at 37°C in a shaker incubator for 18 hours, to transform competent cells. Two microliter of pGEM-B2-Gn was added to 100 µL of competent cells and following a brief vortex, the mixture was placed on ice for 40 minutes after vortex and spin. Then, it was heat shocked at 42°C for 90 seconds and immediately placed on ice for 5 minutes. Next, 1 mL of LB, antibiotic free medium, was added to the transformed cells incubated at 37°C for 2 hours. After incubation, the transformed cells harboring pGEM-B2-Gn plasmid were plated and incubated at 37°C on LB agar plates, containing 10 mg/mL ampicillin and tetracycline overnight. Cells harboring the recombinant plasmid were cultured in antibiotic containing LB medium for 18 hours at 37°C in a shaker incubator. Miniprep kit (Bioneer, South Korea) was used to purify plasmid from E. coli TOP10, according to the manufacturer’s instructions. Briefly, 5 mL of bacterial culture was harvested and lysed. Then, the lysate was cleared by centrifugation and poured onto the silica column. The DNA molecules selectively bind to silica particle of the column. The plasmid DNA was eluted in 20 μL of distilled water. Plasmid DNA concentrations were determined by absorbance at 260 nm using picodrop spectrophotometer (Picodrop, UK). With regard to the presence of Bam HI and Xho I restriction sites on plasmids extracted from transformed colonies, the digestion reaction was carried out to release the fragment of interest. Each 20 μL digestion reaction contained 10 μL of plasmid, 1 µL of each restriction enzyme, 2 μL of 10X buffer, and 6 μL of dH2O. Digestion was performed by incubation at 37°C for 2 hours and digestion products were analyzed by electrophoresis on 1% agarose gel. The specific fragment containing desired gene were purified from the agarose gel by accuprep gel purification kit (Bioneer, South Korea) based on manufacturers’ recommendations. Pure DNA was eluted with a small volume of low salt buffer provided by the kit. 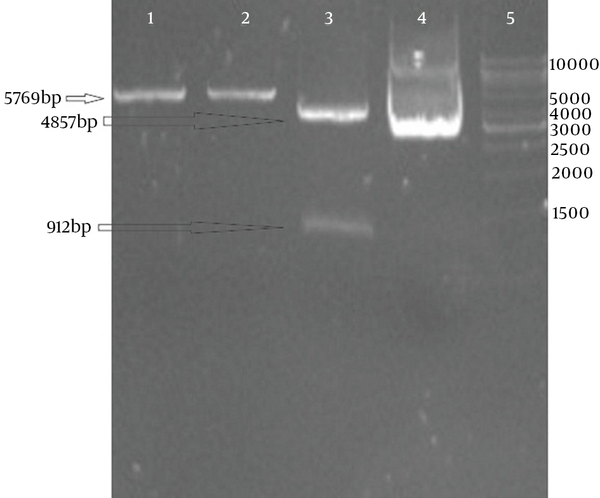 Purified fragments from agarose gel were ligated into pFastBacHTb vector (Invitrogen, Carlsbad, CA, USA) according to manufacturer’s instructions. The molar ratio of vector to insert was 1:3. Ligation reaction was set up with 10 μL volume containing 1 μL pFastBacHTb plasmid, 3 μL of purified fragment, 1 μL of T4 DNA ligase enzyme, 2 μL of 5X buffer, and 3 μL of nuclease free distilled water. After gentle mix and a brief centrifugation, the ligation reaction mixture was incubated at 8°C overnight. The resulting plasmid was named pFastBac-Gn. To confirm and determine the presence and size of inserts in pFastBacHTb-Gn, recombinant plasmid was simultaneously digested with 2 enzymes BamH I and Xho I, then the digestion products were loaded on 1% agarose gel and electrophoresed for about an hour. Also to verify authenticity of the fragments and correct in-frame insertion of construct in pFastBacHTb vector, sequencing in the forward and reverse directions was performed. Gene runner v3.05 (Hastings Software, Inc. USA) was used for sequencing data assembly and analysis. Recombinant vectors were stored at -20°C until transformation. Preparation of competent cells from E. coli strain DH10 Bac was performed by calcium chloride method (18). E. coli DH10 Bac was cultivated in LB, containing 10 mg/mL tetracycline and 10 mg/mL kanamycin in a shaker incubator for 18 hours. Cells harboring pFastBac-Gn plasmid were plated and grown at 37°C on LB agar plates (10 g NaCl, 5 g yeast extract, 10 g bacto-tryptone) with kanamycin, tetracycline both containing 10 mg/mL, 7 mg/mL gentamicin, 100 mM IPTG (Fermentas, Lithuania), and 20 mg/mL X-Gal (Fermentas, Lithuania) for 48 hours. For blue-white screening after overnight incubation, plates were placed at 4°C for 2 hours and cells from white colonies were harvested and cultured on antibiotic containing LB agar plates. After 16 hours incubation at 37°C, cells harboring the recombinant plasmids grew up. White colonies in LB agar were transferred to LB broth, containing 10 mg/mL kanamycin, tetracycline, and 7 mg/mL gentamicin and incubated for 18 hours in shaker incubator, and then high molecular weight bacmid was extracted with laboratory-made solutions based on Invitrogen protocol (tools.lifetechnologies.com/content/sfs/manuals/bactobac_man.pdf). Successful recombination was verified by PCR analysis using M13 forward 5’-GTTTTCCCAGTCACGAC-3’ and M13 reverse 5’-CAGGAAACAGCTATGAC-3’. 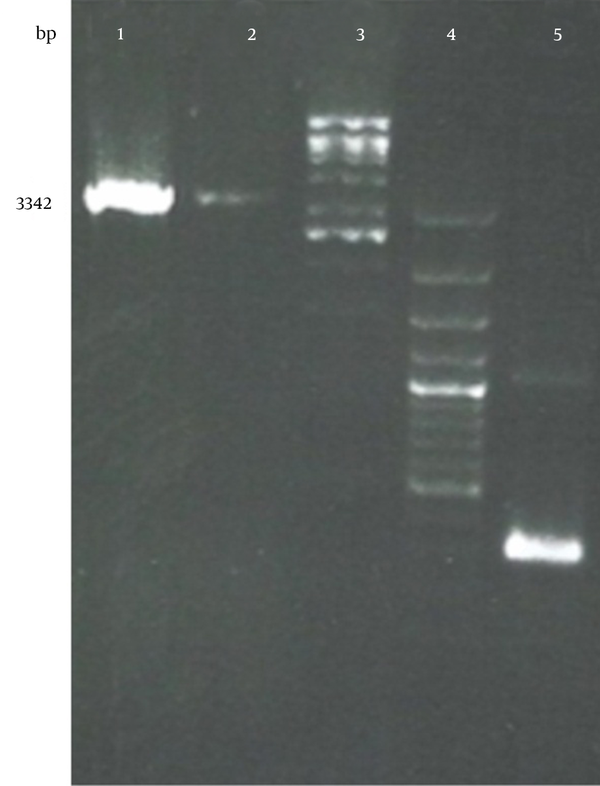 PCR reaction was carried out with M13 forward and reveres primers in a total volume of 25 μL mixture, containing 5 μL of extracted bacmid, 5 μL of 10X PCR buffer with MgCl2, 1 μL of 20 μM of each primer, 2 μL of 10 mM dNTPs mix, and 1 U/μL Taq DNA polymerase (Fermentas, Lithuania). PCR program comprised an initial denaturation at 93°C for 3 minutes; 94°C for 45 seconds, 55°C for 45 seconds, 72°C for 5 minutes (35 cycles), and finally the reaction was held at 4˚C. PCR products were electrophoresed on 1% agarose gel. To ensure of the intact structure of bacmid, it was electrophoresed on 0.7% agarose for 18 hours. Sequence analysis of CCHFV M segment was performed and the region related to Gn was selected and used for designing the construct (Figure 1). The result of phylogenetic analysis among M RNA genome of the CCHFV strains is shown in Figure 2. Multiple Sequence alignments were built with CLUSTAL algorithm (as implemented in the MEGA package version 6) at the amino acid level for the M segment and neighbor-joining phylogenetic tree was constructed. A, Our synthetic construct and its cloning sites and tags B, Figures not to scale. CCHFV strains were presented with regard to the country of origin. Physicochemical parameters of the CCHFV Gn protein were shown in Table 1. Secondary structural features are shown in Figure 3. The results showed that all residues lie under coil, strand, and alpha helix. Tertiary structure of CCHFV Gn was predicted using I-TASSER Server as shown in Figure 4. I-TASSER result provided the best model with high C-score and high correlation between C-score and TM-score of model 1 (0.91). Different C-scores, cluster density, and number of decoys are shown in Table 2. Predicted model 1 was chosen because of low correlation between C-score and TM-score of other models; TM-score RMDS were not reported by I-TASSER. aAbbreviations: GRAVY, Grand Average of Hydropathy; pI, Theoretical Isoelectric Point. aC-score is a confidence score for estimating the quality of predicted models by I-TASSER. C-score is typically in the range of -5 to 2, whereas a C-score of higher value signifies a model with a high confidence and vice versa. bTM-score and RMSD are known standards for measuring structural similarity between two structures which are usually used to measure the accuracy of structure modeling when the native structure is known. TM-score has the value in (0, 1), where 1 indicates a perfect match between two structures. cNumber of decoys represents the number of structural decoys that used in generating each model. dCluster density represents the density of cluster. This model was selected as the best model because of the high correlation between C-score and TM-score. The pGEM-B2-Gn plasmid was successfully amplified in E. coli TOP10. Transformed E. coli TOP10 produced colonies in LB agar, containing 2 antibiotics of ampicillin and tetracycline. Digestion and agarose gel electrophoresis of recombinant pGEM-B2-Gn with 2 enzymes Bam HI /Xho I produced a 912 bp fragment that was similar to the expected construct size. 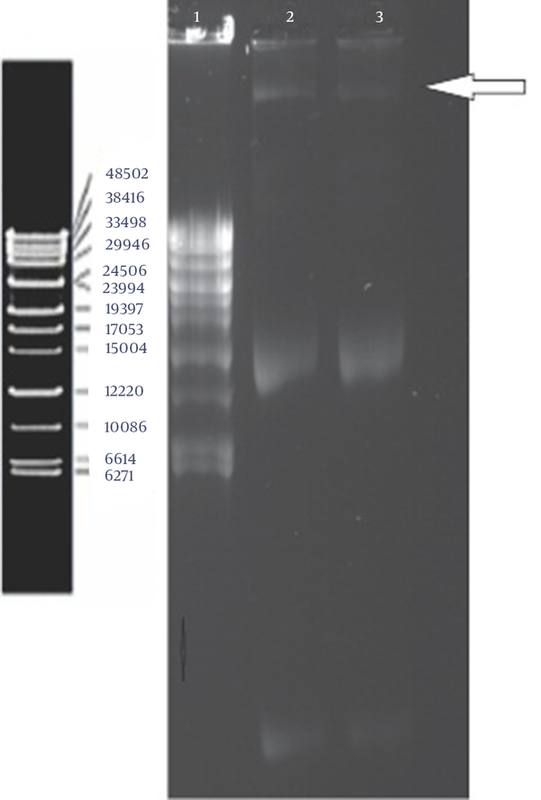 The purified fragment from agarose gel was successfully subcloned into pFastBacHTb vector. Transformed E. coli TOP10 with pFastHTb-Gn was grown on LB agar, containing ampicillin and tetracycline. To confirm and determine the presence and size of inserts in pFastBacHTb-Gn, recombinant plasmid was simultaneously digested with 2 enzymes, Bam HI/Xho I. After electrophoresis of digestion reaction on 1% agarose gel, 2 bands were detected in each lane and attributed to pFastBacHTb band (4857bp) and insert band (912bp for construct). As shown in Figure 5 inserts of expected length were detected. The nucleotide sequencing confirmed that the gene of interest was inserted properly in-frame with His-tag under the control of polyhedron promoter. Lane 1, single digestion with Bam HI; lane 2, Single digestion with Xho I; lane 3, Double digestion; lane 4, Un cut vector; lane 5, 1kb marker (Fermentas, Lithuania). The recombinant bacmid was generated successfully as described in Materials and Methods. Transformed E. coli DH10 Bac produced white colonies while untransformed bacteria formed blue colonies in LB agar, containing IPTG and X-gal. Polymerase Chain Reaction (PCR) was used to confirm the recombinants. PCR was performed using M13 forward and reverse primers, which generated 3342 bp fragment. Selected white colonies generated strong bands after PCR that showed execution of recombination process as expected. As shown in Figure 6, inserts of expected length were detected. Bacmid DNA was extracted from overnight culture of white colonies in LB agar and electrophoresised on 0.7% agarose (Figure 7). Lane 1, 2; bacmid with insert, lane 3; 1kbp marker (Fermentas, Lithuania), lane4; 100bp marker, lane 5; bacmid without insert. Lane 1, ladder lambda (Fermentas, Lithuania); Lane 2 and 3, bacmid. Crimean-Congo hemorrhagic fever virus causes severe hemorrhage in human with mortality rate of approximately 30%. It is reported in many countries of Africa, Asia, Middle East, and southeast Europe. The geographic distribution of CCHFV is the most extensive in comparison with other medically tick-borne viruses and has expanded in recent years as an increasing number of epidemics and sporadic cases have been reported in many regions of the world. Global climate change may be a reason for increasing the number of cases in recent years (1-4). Despite the fact that CCHFV is a member of Bunyaviridae, it has some unusual properties compared to members of other genera: first, CCHFV genome M segment encodes an unusually large polyprotein, which is a large precursor with 1684 amino acids in length; second, viral glycoprotein precursors usually undergo only one proteolysis processing step but (in the case of CCHFV) M polyprotein needs a complex series of proteolysis processing before generating mature glycoproteins; third, CCHFV glycoproteins (Gn and Gc) contain cysteine residues, suggesting the presence of disulfide bonds and a complex secondary structure (1, 13, 17, 19). Currently, there is no available vaccine against CCHFV and detailed structural analysis of CCHFV proteins remains undefined. In this study, first we used bioinformatic software to determine the structure of CCHFV Gn protein, and then design and clone a construct recombinant bacmid to express Gn for studying its immunogenic potentials in future. 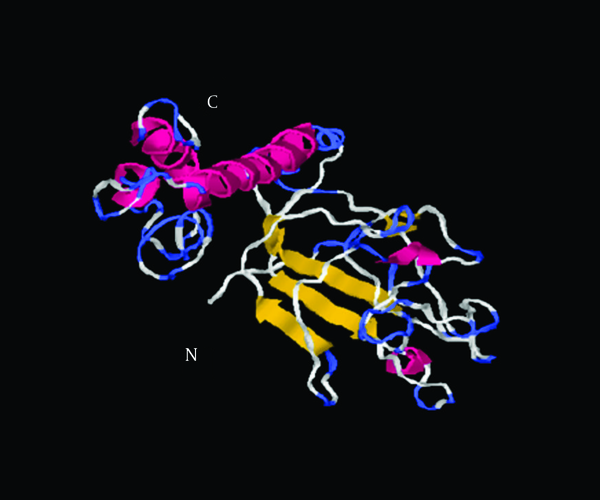 The primary structure of CCHFV Gn was speculated with ExPASy ProtParam (20). Physicochemical parameters of the CCHFV Gn protein showed that it has 285-aa long sequences and a molecular weight of 33587.8 Daltons with theoretical isoelectric point (PI) of 6.65. The instability index is computed to be 32.67; the instability index provides an estimate of the stability of protein of interest in a test tube. Values greater than 40 indicate that the protein may be unstable in vitro. Based on ProtParam analysis results, Gn is classified as a stable protein. The secondary structure of CCHFV Gn was predicted and analyzed by PSIPRED (21). The tertiary structure prediction was performed by I-TASSER server using the best align template (22). Out of 5 generated similar models of the target sequence, the best one was chosen to employ the criteria of good C-score, TM Score. The predicted 3D structure will provide more insight in understanding the structure and function of the protein. Neighbor-joining analysis had separated CCHFV into 4 broad groups, which predominantly contained viruses from Europe/Turkey, Africa, Middle East, and West Asia. M segment sequence alignment of Iran strain compared to other strains showed a close relationship between Iran strain and Afghanistan strain with 99% similarity. Both Gn and Gc are modified by N-linked glycosylation so eukaryotic expression system is necessary for proper folding of glycoproteins. Erickson and collogues in their study indicated that 2 glycosylation sites (557N and 755N) are present in mature Gn glycoprotein of CCHFV. Of them, 557N site is important and mutational blocking of Gn glycosylation at 557N results in mislocalization and retention of Gn and other proteins synthesized from the virus M segment ORF (GP160, GP85, GP38, and Gc) in the endoplasmic reticulum (19, 23). Gn and Gc glycoproteins of CCHFV may involve in the host range, cell tropism, and pathogenicity of this vertebrate and tick virus, and are the targets for neutralizing antibodies. So, cloning, expression, and determination of neutralizing epitopes may have significant diagnostic and therapeutic applications (18, 19). Currently, diverse prokaryotic and eukaryotic expression systems have been developed for cloning and expression of recombinant proteins. E. coli is one of the most widely-used prokaryotic expression systems because of its easy manipulation, low cost, and high production of recombinant protein. Lack of posttranslational modification mechanisms in bacterial cells such as glycosylation, proteolysis protein maturation, or limited capacity for formation of disulfide bonds are disadvantages of this expression system (24, 25). In the case of enveloped viruses, proteolysis cleavage and glycosylation are very important, which can modulate biological characteristics of the virus. Expression of Gn in E. coli might yield large amounts of protein; however, Gn is a glycosylated protein with disulfide bonds so its expression in E. coli cannot produce an active protein. Among eukaryotic systems, the baculovirus expression system has many advantages such as high protein production, correct folding and safety and most importantly, posttranslational modification (like glycosylation) in insect cells which is critical for Gn antigen. Many of researchers have used baculovirus expression systems in various viral agents (26-28). The role of the glycoprotein encoded by M segment in neutralizing and protecting antibody in animal and human body infected by Hantavirus has already been demonstrated. In the case of CCHFV, several studies have shown that passive transfer of convalescent serum of patients infected with CCHFV to acutely infected patients can confer some protection to the patients (19). Reports about the production of neutralizing MAbs against CCHFV glycoproteins are limited. In one study, Bertolotti-Ciarlet and collogues demonstrated that monoclonal antibodies (MAbs) obtained from mice against CCHFV Gn were more effective on protecting mice from a lethal CCHFV challenge than MAbs against Gc when administrated either 24 hours before or after the infection (17). Many researchers have used Gn glycoprotein of other members of family Bunyaviridae as a candidate vaccine component in different expression systems and concluded that this gene can be considered as a potent immunogen in vaccine development (29-33). Currently, there are no specific treatments or licensed vaccine for CCHFV. Reports on detailed bioinformatic study and also developing a vaccine against CCHFV are limited. On the other hand, the production of native antigens for CCHFV has several limitations such as high risk of contamination by handling the virus; high level bio-containment facilities required for working with the virus (not available in many laboratories) and low number of cases (2). Therefore, producing CCHFV surface glycoproteins, including Gn by recombinant DNA technology and characterizing their immunogenicity’s will be important in vaccine development as well as in research and diagnostic laboratories. Because CCHFV is a health problem in our country, any attempt on developing a candidate vaccine for this virus is extremely important. Cloning and production of recombinant protein is the first step in designing a safe vaccine against a highly pathogenic organism like CCHFV. To the best of our knowledge, our project was the first attempt to clone CCHFV glycoprotein in baculovirus expression system in Iran and an indispensable step in future studies for CCHFV vaccine development. We would like to thank our colleagues who assist us in conducting this study. This paper was part of the project of Virus PhD student Mr Mehdi Rahpeima performed in Health Research Institute, Infectious and Tropical Diseases Research Center, Ahvaz Jundishapur University of Medical Sciences, Ahvaz, Iran. Authors’ Contribution: Mehdi Rahpeyma and Alireza Samarbaf-Zadeh developed the concept and designed the study. Manoochehr Makvandi and Ata Ghadiri advised the study. Mehdi Rahpeyma performed the experiments, conducted bioinformatics analysis and wrote the paper. Alireza Samarbaf-Zadeh and Fatemeh Fotouhi interpreted the results and revised the manuscript. Funding/Support: This study was supported by the grant No. 91119 approved in Health Research Institute, Infectious and Tropical Diseases, Ahvaz Jundishapur University of Medical Sciences, Iran.